Europe will get the Mercedes GLS Grand Edition first, but North America won’t be too far behind. If the Mercedes-Benz GLS SUV somehow isn’t already luxurious enough for you, the German automaker has announced it will be bringing the even more lavish Grand Edition to US dealers in mid-2018 after it . Due to make its North American debut at the upcoming Detroit Auto Show next week, the Mercedes GLS Grand Edition features a slew of exclusive interior and exterior enhancements. Starting with the opulent cabin, the GLS Grand Edition is fitted with Nappa leather seats in Porcelain white with diamond quilting exclusive to the model and special Budapest-design piping, while other sections are finished in Espresso Brown such as the leather-wrapped dashboard to provide a pleasing contrast. Elsewhere, the seven-seater SUV’s interior is coated with an open pore brown ash trim with light stripes, and comes equipped with ambient lighting and Espresso Brown velour floor mats as standard. As for the elegant exterior, the Grand Edition version of the GLS450 4MATIC features 20-inch 10-spoke two-tone wheels and an advanced LED Intelligent Light System. 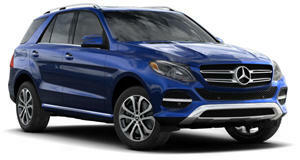 As standard, the GLS550 4MATIC is equipped with 21-inch wheels and Active LED headlamps. Both models are finished with the special "Grand Edition" badging to distinguish the high-end model. Powering the GLS450 is a 3.0-liter V6 engine with 362 hp and 369 lb-ft of torque, while the GLS550 has a 4.7-liter V8 with 449 hp and 516 lb-ft of torque. The new Grand Edition should pave the way for the all-new GLS expected to arrive sometime in 2019 and will ride on Mercedes’ new MHA platform which should trim some fat off the large SUV and bring the weight down. It would also make sense for the all-new GLS to utilize the 3.0-liter inline six-cylinder unit powering the refreshed S-Class.